As the blog rules say, when you first start a blog you should pick an audience type and have a subject or topic for your blog – and then stick to it. When I started Unearthing the Spud, I did none of these. I was curious about blogging but didn’t have any direction, I just wanted to start and discover what I wanted to write about as I went along. There was no purpose to it. I didn’t care if not one person read it. I just wrote about things as they popped up – current events, things in my life or my community, my opinions and so on. I really didn’t have any rules for my blog! I even changed my blog layout quite a few times for fun….which is supposedly a big no-no in the blog world. Oops! That is the beauty about it being your blog – do what you want and people can choose to read it or not. Over my blogging time, I have found my niche for what I really got a kick out of writing about. I started to want to write more and more about food. As I discovered more about health, I wanted to share what I was learning too. For this reason, Unearthing the Spud has been morphed into Farmer K’s Kitchen. Here is where I write about what I cook. Go over and check it out, and if you like it – please follow along! I even have a facebook page. My blog is about nutritious recipes that taste awesome, and sometimes you will see health info pop up on there too (like eating bee pollen and charcoal), some of my farm stories, a little bit about my life, and a touch about food origins. I would like to say thank you to those people out there who have subscribed to Unearthing the Spud and I hope to see you over at Farmer K’s Kitchen soon. Continuing on from my last post (Part 1: What is Gluten Exactly? ), we are going to jump straight into how to be diagnosed with a gluten intolerance, sensitivity or Celiac Disease….or not. Yep, true stuff! The majority of people who can’t eat gluten will go for a test and the result will be negative BUT it should have been positive! They actually are sensitive to gluten or they have Celiac Disease, but the results will say no. Thankfully, things are looking up for the testing of gluten sensitivity in the medical world. Cyrex Labs (www.cryrexlabs.com) is starting to get high success rates since January 2011. They do their testing through salivary panels covering all areas of gluten. They also make available a test that can pinpoint the very areas of your body that are being most affected by gluten. To get your hands on these tests, you must go through a licensed medical care provider. I have been asked many times if I am going to get tested for Celiac Disease, and honestly I personally don’t see the point. If there is a high chance of the result being a misdiagnosis, why don’t I just skip all the drama and just cut gluten out of my diet anyway? After all, we know for a fact that gluten is bad for everyone. If there were more reliable tests available (Cyrex Labs is leading the way!) and through this I discovered that I didn’t have gluten intolerances, I would still cut it out of my diet. As I said in Part 1 of this gluten series, most people have ‘Silent Celiac Disease’, which means they do not have any noticeable symptoms at all so they have absolutely no idea. Do you have any symptoms? This is pretty scary seeing as gluten can do so much damage to your body (as we covered in Part 1)! 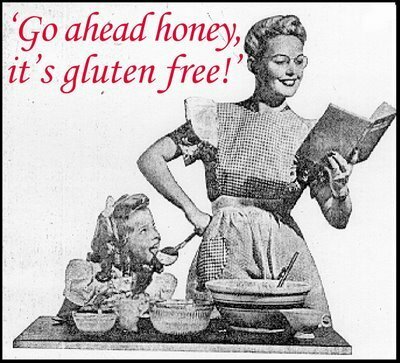 My naturopath, my doctor and a health expert have all said that no one should eat gluten anyway. Even those who do not have any noticeable symptoms. I think immediately of my husband who eats mainly gluten-free with me, but will still have the odd hamburger or cake. He seems to handle gluten fine (unless he has ‘Silent Celiac Disease’!) but inside his body is working mighty hard to process it. Everyone’s body has to work extra hard to accommodate gluten. From Nora’s book: Primal Body, Primal Mind: People often think that the symptoms to watch for when it comes to gluten issues are typically gastrointestinal, when gluten sensitivity can, in fact, profoundly impact your brain, nervous system, emotional states, endocrine functioning, neurotransmitters, immune system, bones, joints, skeletal system, and any possible aspect of your mental or physical physiological functioning. So basically, no one should be eating gluten. Full stop. The next post, Part 3, will be all about ‘Cross-Reactivity of Foods’. I have had first hand experience with this one! In this we will also look at the relationship between gluten and coffee. 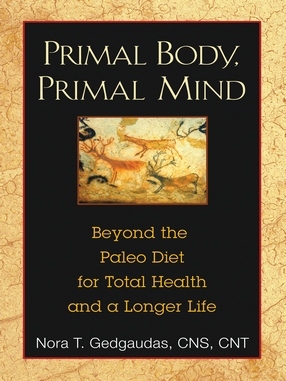 I have been reading a fantastic book called ‘Primal Body, Primal Mind’ by Nora Gedgaudas (I will leave that pronunciation up to you!). It is about gaining optimal health by eating well and avoiding the so-called ‘food’ that our food companies have created for us. Food that isn’t really food anymore. We don’t know how it was made, what is in it or the damage it is doing to our bodies (even though the food companies know the mountains of facts proving their ‘food’ is causing us major health problems). Don’t get me started – it makes me mad. So, our option is to take back the control and go back to the basics…eat primal! When I started going gluten-free I was overwhelmed with all the information out there. The many do’s and don’ts, which can sometimes be conflicting – do eat rice, don’t eat rice – do eat buckwheat, don’t eat buckwheat….it was doing my head in! After tons of reading, loads of questions and through my own experiences I decided to share what I have learned. I am by no means a doctor or health advisor – I am just sharing my learnings with you. Nora’s book has really helped me to clear my understandings of gluten and it is actually not all that complicated. More and more friends are asking me how to go gluten-free and what it involves – hopefully this helps! I am going to have to break this information up into parts as there is quite a bit and I don’t want to miss out on any important details. This post will be Part 1 where I will go into what gluten actually is. Then the following posts will go into diagnosis, healing, cross-reactivity with other foods (you will hear doctors say “don’t eat gluten…OR dairy”) and anything else that I can think of to share. Stay tuned and please comment with your thoughts or gluten stories. Firstly, the word Gluten is derived from the Latin word glue. This in itself should not sit right with you. Gluten was actually used to stick wallpaper onto walls! It is the stuff that makes food stick together, be soft and fluffy, and sometimes cause us to be addicted to the stuff. Gluten has absolutely no benefit to our bodies. There is nothing in gluten that we need. No nutrients, vitamins or minerals we require from gluten. If we eliminate it from our diet, there is nothing we miss out on. 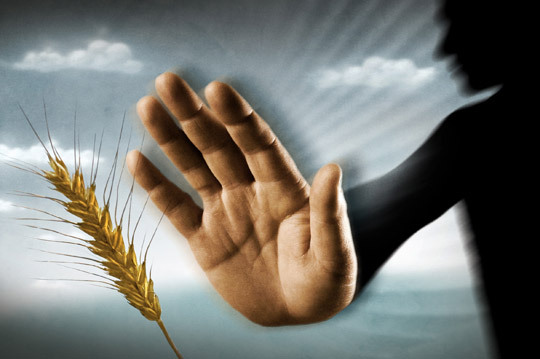 Some people get very confused between Celiac Disease and gluten intolerance or sensitivity. We tend to think that one is worse than the other but this is not true. To quote from Nora’s book, ‘All celiac disease is a form of gluten sensitivity but not all gluten sensitivity is celiac disease.’ They just have different genetic markers. They are both equal in danger to our health. Although other grains such as corn, millet, quinoa, rice, buckwheat and soy do not technically contain gluten, gluten contamination in many of these foods are extremely common. I do eat quinoa…but only very small amounts, and I tune into my body to see if I react (which I do…very badly with gluten). Gluten is everywhere 😦 , and unless a product is clearly labelled ‘GLUTEN-FREE’, I wouldn’t eat it. Gluten can be labelled as other things such as food emulsifiers, artificial food colouring, vegetable (or hydrolysed) protein, modified food starch, dextrin…and so on. So you really have to read your labels if they don’t clearly state ‘Gluten Free’. So what damage does it do to our bodies? 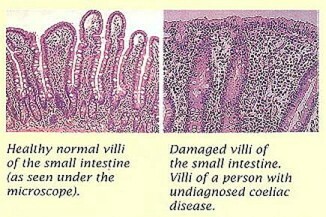 Gluten flattens the very important villi which is the lining of your small intestine (it looks like shag carpet). This villi is responsible for absorbing all your nutrients and so on. Gluten will actually turn this healthy, shag carpet villi into a completely destroyed flat zone where you are unable to absorb the “good stuff” from your foods. If you are not absorbing the things your body absolutely needs for you to survive, you fall into many health problems. Gluten definitely does not just affect the digestive system. ‘Gluten sensitivity can be primarily and at times exclusively a neurological disease, affecting not only the brain and nervous system directly, but also cognitive and psychiatric illness.’ (Hadjivassiliou)It affects the brain – when you consume gluten, it shuts off the blood flow to the frontal and prefrontal cortex which is responsible for short-term memory, focus, managing of emotions, planning and organisational skills. Eating gluten has proven to cause ADD/ADHD, depression, heart problems, chronic inflammatory conditions, immune system, diabetes, musculoskeletal system, nervous system, moods, eczema, joint pain, and kidney issues. Gluten is the root cause of many health issues (and deaths). In Nora’s book, she shares that The New England Journal of Medicine discovered that 55 diseases are KNOWN to be caused by gluten. Among these are heart disease, cancer, nearly all autoimmune diseases, osteoporosis, irritable bowel syndrome, gall bladder disease, Hashimoto’s disease (an autoimmune thyroid disorder), epilepsy, migraines, Parkinson’s disease, lateral sclerosis, autism (which is technically an autoimmune brain disorder), anxiety issues, bipolar disorder, dementia, and schizophrenia. I hate to be a downer, but gluten can kill you. 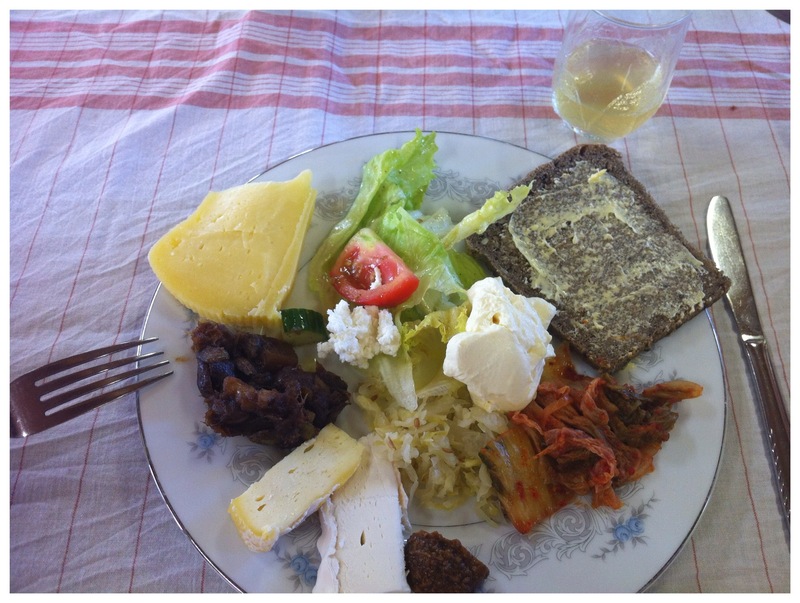 On the weekend I went to a fermentation workshop to learn the art of making my own Sourdough Bread, Kimchi, Sauerkraut and Fruit Wine. It was such a great day, and I learnt a lot! 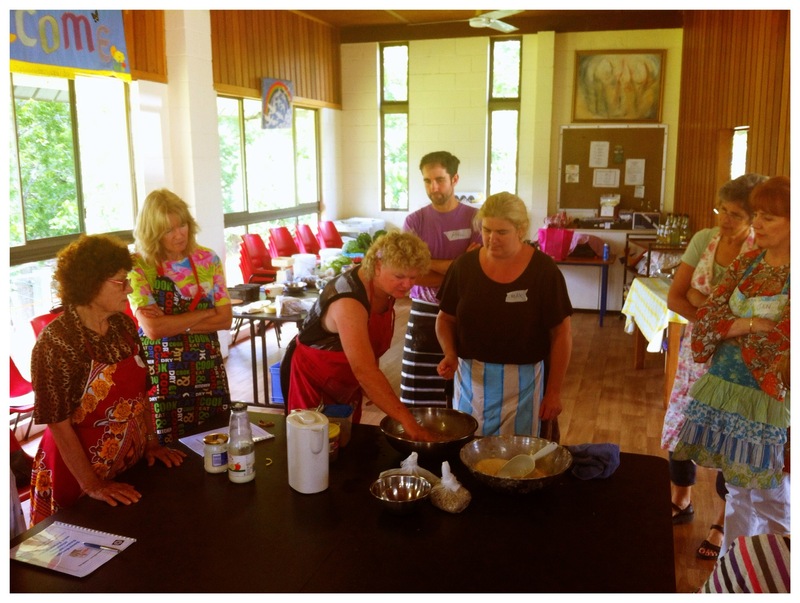 The lady who ran our workshop was Elisabeth from Permaculture Real Foods, based on the Sunshine Coast. To me, the fermentation previously sounded kind of gross as it conjurs up thoughts of food that is off and mouldy and going rancid. After the workshop, I got an insight into the health benefits and non-off-ness of the foods you can ferment. I had it completely wrong! 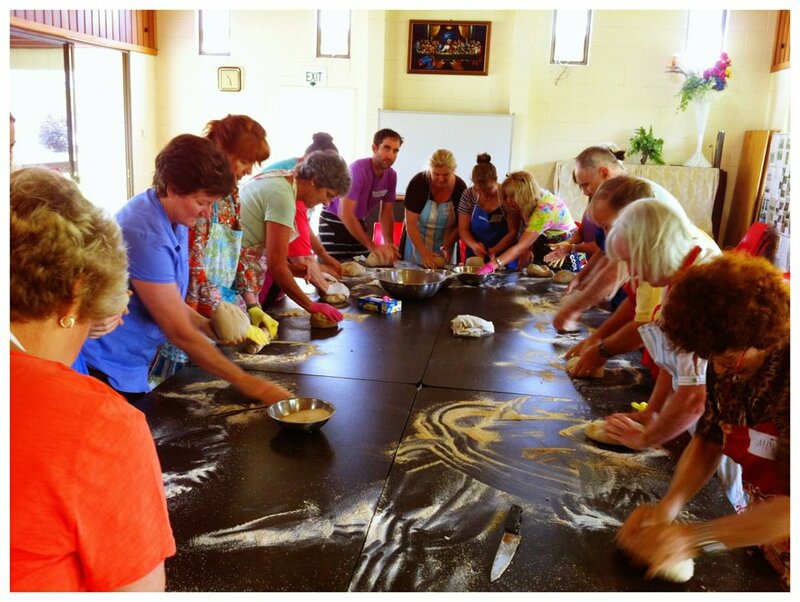 First we learnt how to make sourdough bread and pikletes. Yum! I can’t eat gluten, but tried some of this as there is a high possibility that someone who is gluten-intolerant can eat sourdough as the grain has been broken down during the fermentation process, and therefore easier to digest. Hmmm. This didn’t exactly work for me and about 30 minutes after having a piece I was headachy, lethargic, battling to keep my eye lids open, and then spent the rest of the afternoon and evening crampy and bloated. It took 2 days to calm down. I guess at least I can enjoy making it for others, but not eating it for myself! Fruit wine making came next – you can make wine out of any kind of fruit, although some fruits are not as tasty as others. Our workshop leader said that a good indicator on what flavours you may experience in your wine is to try and imagine what the fruit would taste like without the sugar flavour in it. That is pretty much how it will taste as a wine. Strawberries and mangoes sound awesome, but they are quite bland. Elderberries and lemon = divine! 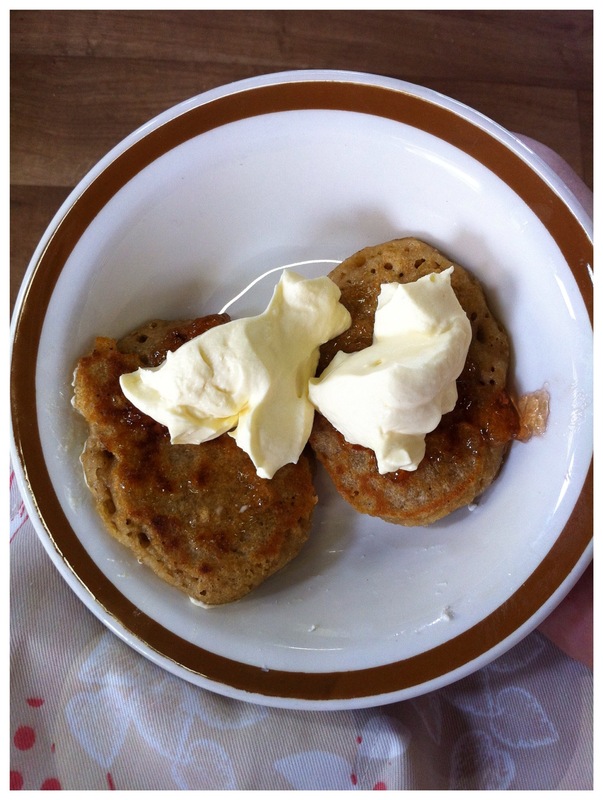 We enjoyed our pikletes with homemade sour cream, cottage cheese and jam for morning tea. 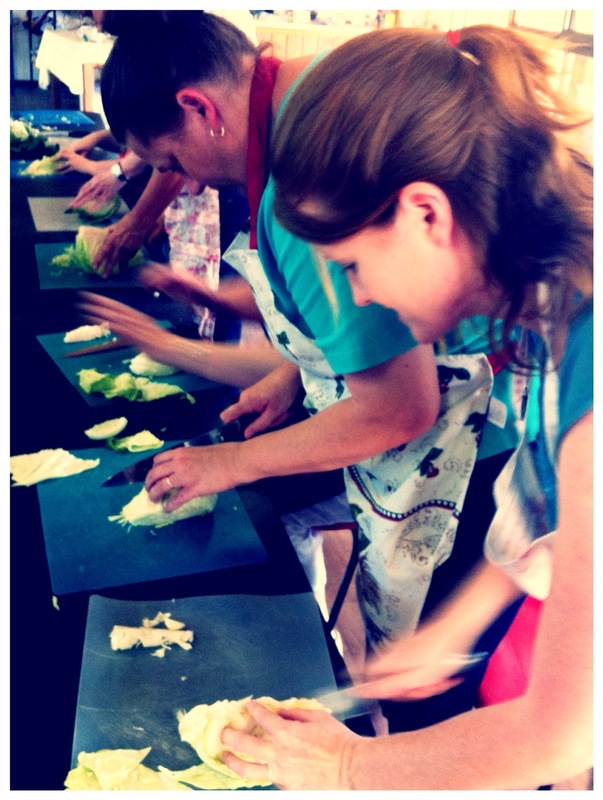 We then went on to making sauerkraut which was divine! Lots of Vitamin C in those cabbages and very good for your health. We also made kimchi which are fermented veggies with loads of punch! Very spicy, hot and yummy! 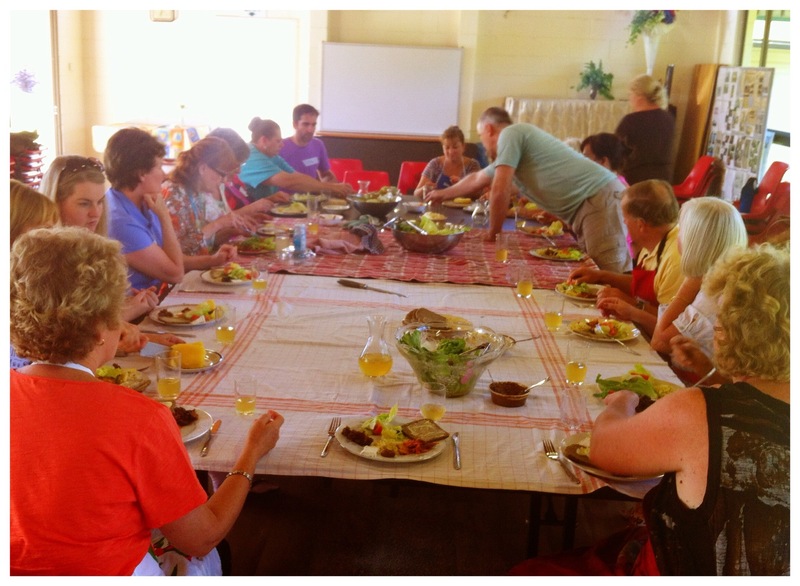 For lunch we ate all the foods that Elisabeth had either made from scratch or grown in her garden. Looks like a Christmas lunch! It was delicious! I especially enjoyed the cheeses that she had made previously. Elisabeth runs a cheese making course as well, which may be on my workshop list for next time. I was spending an awful lot of time flicking through my favourite food blogs when my eye balls stopped on the ingredients “bee pollen”. I thought to myself, could this be? Actual bee pollen collected from a flower and found on a tiny bee’s legs? I had to try this stuff! Bee pollen is different from the pollen that is airborne which causes allergic reactions. We all know how good raw honey is for you and the honey you buy from the shops is not raw, but boiled and broken down…which is a shame. We always have to stuff around with perfect nature don’t we! Pretty much any thing that bees touch turns to gold, including the pollen from flowers! I found some bee pollen in the far back corner of a small health food shop and I was feeling very pleased with myself. Such an exotic sounding ingredient I had my hands on, but when I went to the checkout the man told me that this had become very popular at the moment and loads of people had been buying it. Maybe not so mysterious and exotic – but it still was to me. Maybe it was something like that Goji Berry craze a year or so back when they first hit the shelves (I love goji berries!). Everyone started to hear about this superfood with all its antioxidant-goodness. 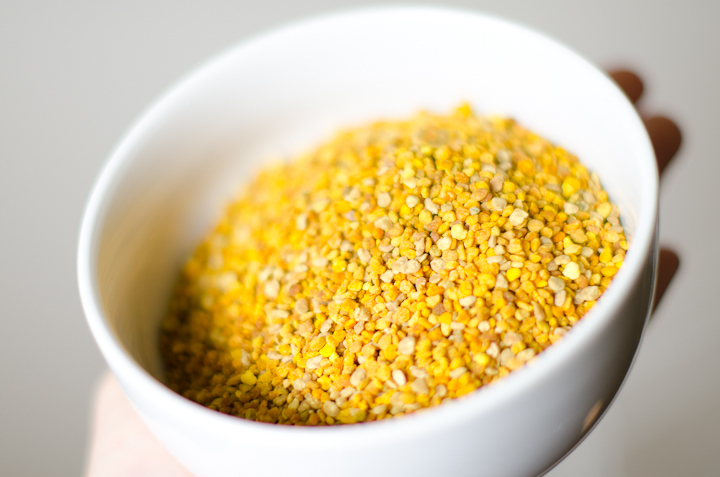 Here is a photo of the bee pollen I bought. The different colours are from the various flower types the bees have visited. They take this pollen back to their hives and the pollen is harmlessly brushed off as the bees crawl into the hive. 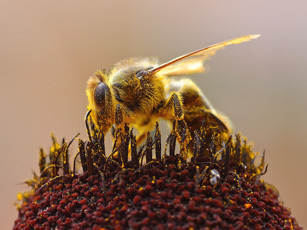 The honeybee collects only the purest of pollens. It avoids all toxic plants, including those contaminated with pesticides. The pollen isn’t as effective if it is taken straight from the flower. You need bee spit to bind it and activate it. Yum. It tastes like powdery, flowery, honey goodness. I like it. I put it on my yogurt, or fruit, or blend it up in my juice. You only need a teaspoon or two a day. it is very high in protein, containing between 20-35%, including all 22 amino acids. it supplies human bodies with nearly every single nutrient we need to survive. jam-packed with vitamins, minerals, trace minerals, and phytonutrients. balances the blood, lymph, and aqueous and general metabolism system. contains active antibiotic substances, which destroy bacteria on contact. useful in cases of stress and nervous endocrine system disorders due to its high content of natural B Vitamins. increases energy and mental alertness and is believed to slow down the ageing process. this one convenient source is a storehouse of vitamins, minerals, proteins, fats and oils, carbohydrates, amino acids, over 5,000 enzymes and coenzymes, hormones, peptones, polypeptides and globulins, high concentrations of the nucleic acids RNA and DNA, and a variety of antibiotic substances. You should always store your bee pollen out of direct sunlight. 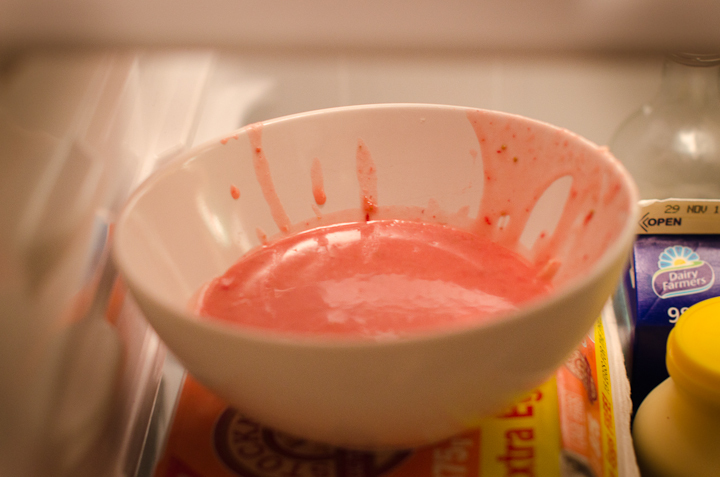 The best place for it is in the freezer and here it will keep it strength for up to 2 years. I was scouring over the recipes on the Thermomix Recipe Community (when I should be writing reports….I know) when I came across something that looks easy, yummy and perfect for work – “Finger Buns”. I like to try and find ways to make the food we eat more organic and less processed, so thought I would have a go at making these little beauties before I sat down to write reports. I never thought I would be someone who would go organic in my food choices when I can. I have always thought the whole “organic vs. sprayed” food debate was a bunch of baloney…..but now after researching it myself, I get it. Not everything hubby and I eat is organic – no way! – but we try and substitute when we can. BUT I definitely steer well away from Genetic Modified Foods…that is just plain freaky! Buns –I had to add more SRF to the mixture as it was too runny. I am told by my taste-testers that this is the BEST dough recipe ever. “Tastes just like damper”. Icing Sugar – a bit too runny, so put it in the fridge to set. It was the water content of the strawberries I bet! 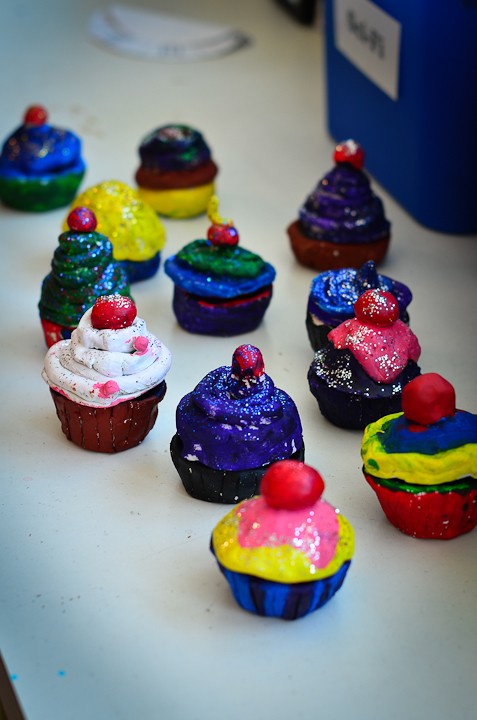 The icing hardening in the fridge. 1. Preheat oven to 220C. Line baking tray with baking paper. 3. Remove MC & place a tall empty cup ontop of TM lid. Clear the scale. Add milk & egg into cup. 4. Place TM on REVERSE 15 sec/sp5, while adding milk & egg mixture through the lid hole. Do not over-mix. 5. Knead for 30 sec/Interval sp. 6. Turn onto lightly floured surface. 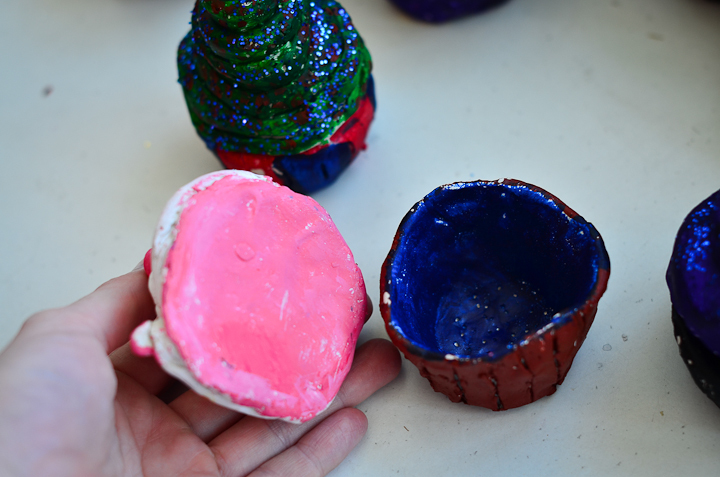 Break into 10 even sized pieces & shape into oval finger bun shapes (smaller is better). 7. 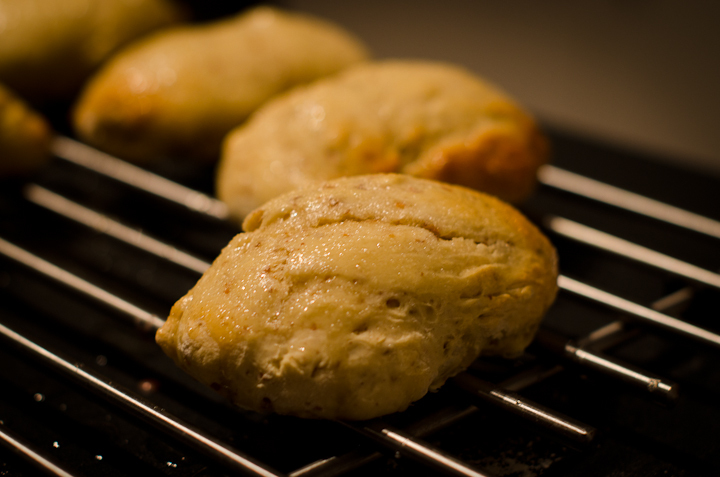 Place buns close together on baking paper & brush top lightly with milk. Bake for 12-15 mins until very light brown. 1. Combine water & castor sugar in a small cup. Brush over hot buns & allow to cool on a wire rack. 2. Add the pureed strawberries (or food colouring) & mix for a further 3 sec/sp 4 with BUTTERFLY. I strangely didn’t take a photo of the finished product because….well….I forgot. They got wrapped up and ready for lunches. You can use your imagination though. They got the big thumbs up from husband! 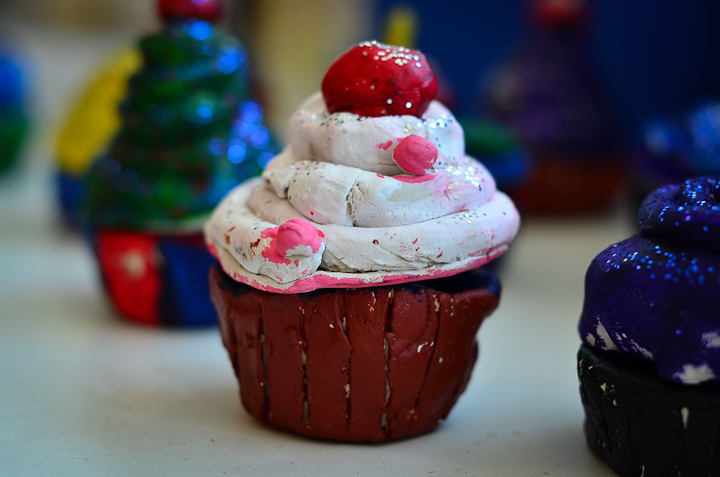 For the past two weeks, my class and I have been working on an art project – cupcakes made out of clay! 1. 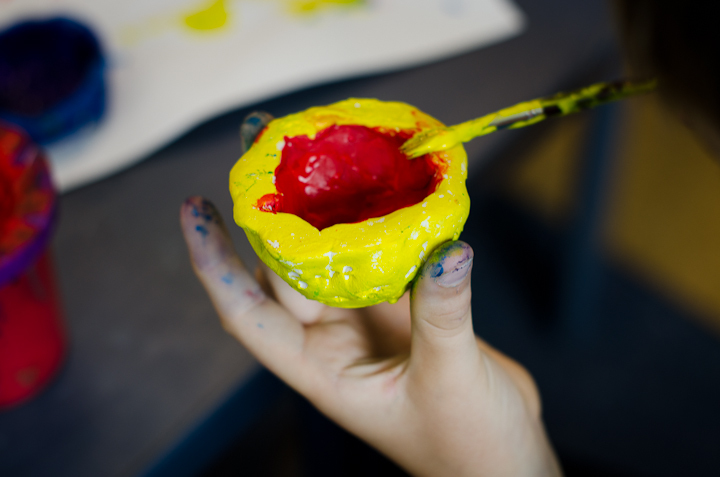 Make a ball of clay. 3. Make another ball of clay. 5. For the top, make a cherry or some twirly icing. 6. 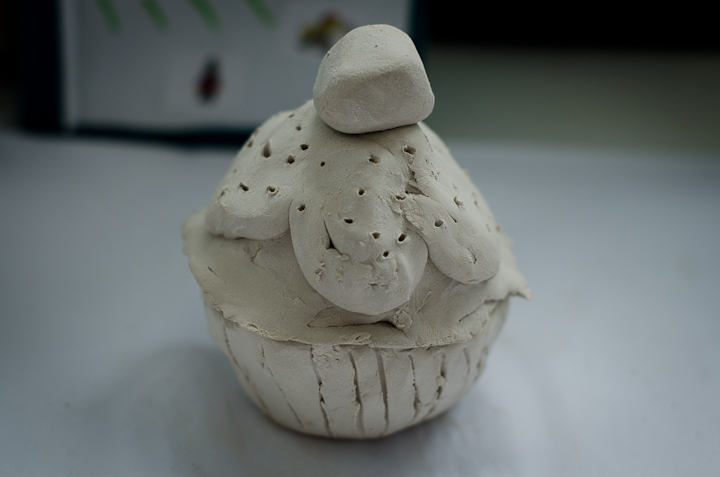 Make sure when you attach clay on clay, you rough up the surface so the pieces stick together after they have dried. 8. Once dry, paint with acrylics and add glitter if you like.